I don’t trust the previous owner of the bike. 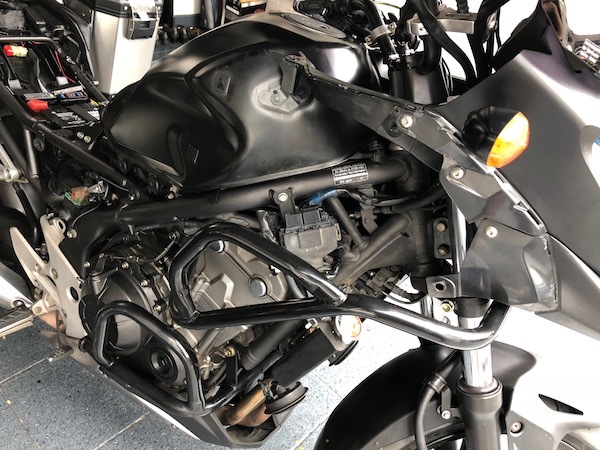 Just before the handover, he had agreed to replace the bike battery (it died while viewing) and perform a once-off engine oil change. 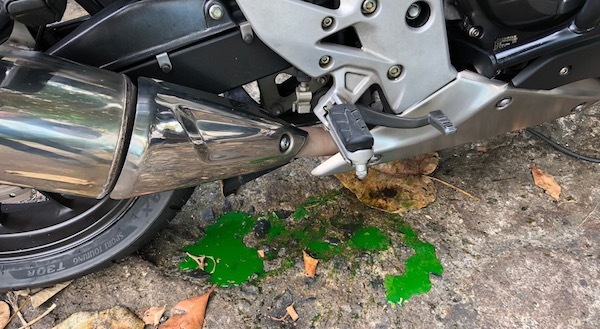 I specifically asked if he used a fully-synthetic oil – and he said YES; though he couldn’t recall the oil name (red flag!). So he arranged for tow and got the agreed stuff replaced. 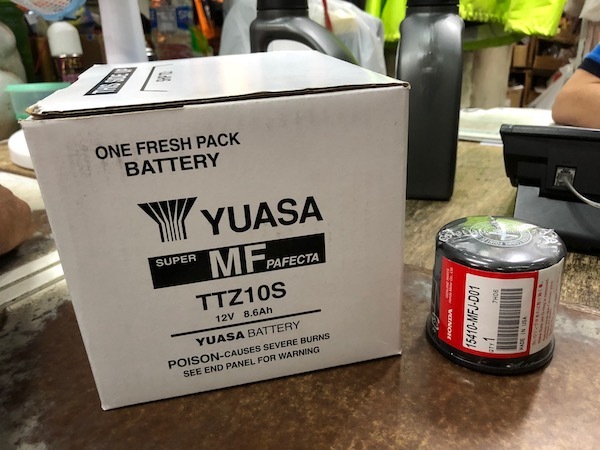 Mobil Super 4T 10W50 mineral oil and the removed Yuasa battery. Firstly, Mobil Super 4T is a mineral oil – not synthetic. Next, the manual calls for 10W30 viscosity on the CB400X / CB500X. While I’m comfortable going one grade higher (say, 10W40), I feel that 20W50 is way to thick for the efficient Honda parallel twin engine. But that’s not all. When I lifted up the bike seat to inspect the newly installed battery, it was a smaller, cheaper YTZ7S. The YTZ7S has 6Ah and 130A of CCA (cold cranking amps). Comparing that to the original-spec’ed battery – the YTZ10S has 8.6Ah capacity (43% more) and 190A of CCA (46% more)! No wonder I always had some trouble starting the CB400X engine in the mornings! So I headed to LAB this morning to get my stuff. The made-in-Taiwan version of the YTZ10S – the Yuasa TTZ10S! 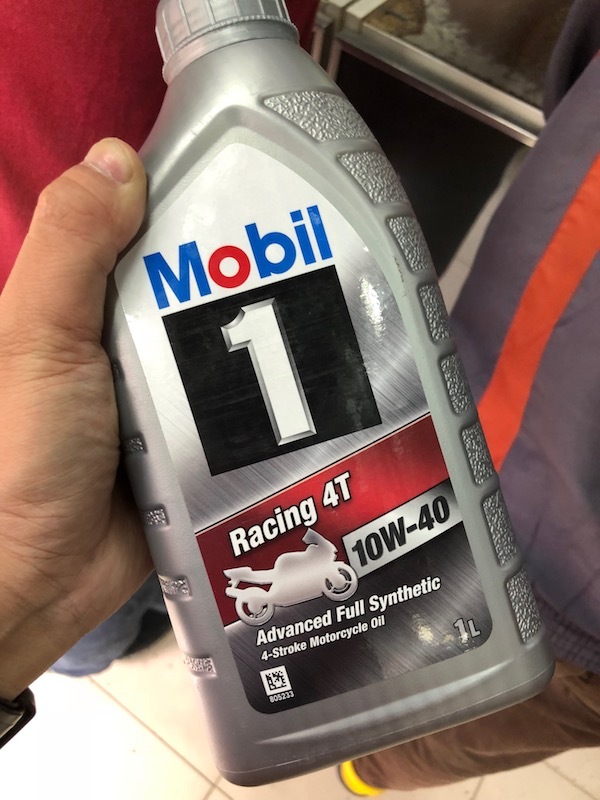 The Mobil 1 4T fully-synthetic engine oil is probably a safe bet. Decided on the 10W40 grade. 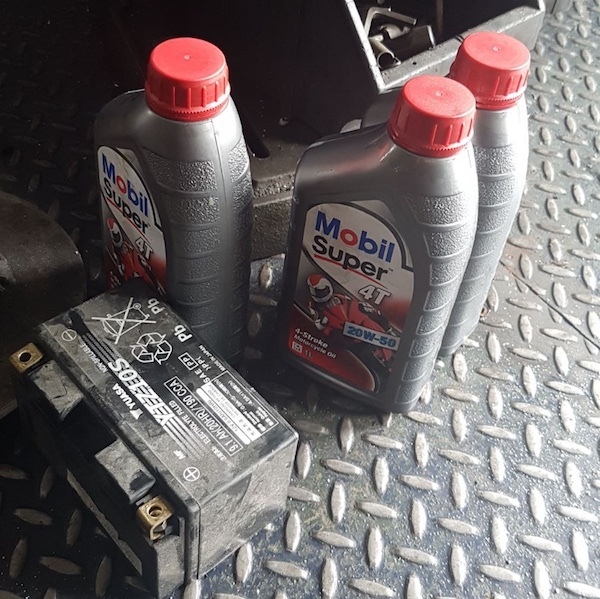 Since I had a bottle of Motul Engine Clean lying around, and precisely because I didn’t trust the previous owner in his bike maintenance regime, I decided to perform a one-off engine flush procedure with the existing mineral oil. Coolant bubbling and spewing out onto the ground! A quick check on the radiator cooling fan, and I realised it wasn’t running. And being a Sunday, I probably can’t get a mechanic to work on it or even obtain the necessary replacement parts. And now with this overheating and coolant overflow, I do recall feeling the engine running a little on the warm side. I had initially attributed it to a larger (400cc) engine as compared to my Pulsar (200cc), and thought that the heat was normal. Now I know it isn’t. Well, actually, come to think about it, I don’t ever remember hearing the fan on the 400X go off – even on a warm day or while climbing up the multi-storey carpark. Side fairing removed. Radiator exposed. Time for some troubleshooting. So I rode the bike home in very light traffic (thankfully! ), and immediately started tearing down the fairings to start figuring out what’s wrong. Of course, there’s always a chance of a fan failure or a switch failure. But my initial suspicion (and hope) was a disconnected or loose fan wire connector. 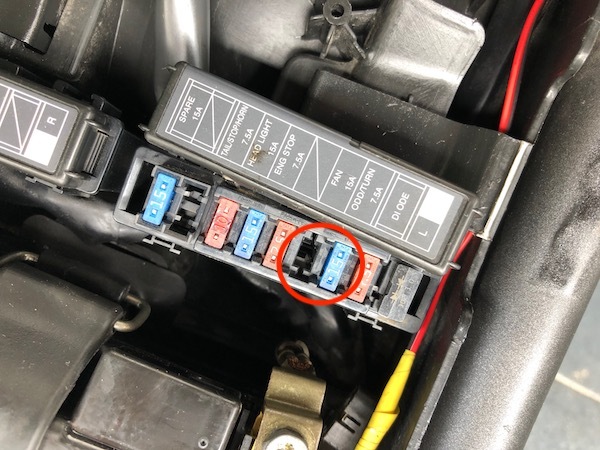 I eventually found the connector and inspected it for signs of corrosion or improper seating – no joy. All looked good. Can you tell what’s wrong there?? The 15A fan fuse was placed in a spare / unused slot instead! Being familiar (and very particular) with electrical / electronics wiring, I’m absolutely certain that I’ve never moved the fuse. Somehow, the previous owner / workshop mechanic must have moved it and placed the fan fuse in the WRONG slot! That is such an unforgivable mistake! Arrrgh! After moving the 15A fuse back into the correct slot, I started the (now already) cooled bike and left it on idle of 20mins. The sweet sound of the radiator fan came on at approximately the 15 min mark. Ah! The fan, the switch, and basically about everything worked after all! That’s the Honda reliability that I’ve come to know of! And oh yes… I got my rear suspension preload adjusted too. Increased it to compensate for the rider weight (I’m almost 90kg!) and the heavy’ish aluminum boxes. After all these do you recommend other riders to get a new bike instead? If you have the cash – get new. If you don’t, or want to save some money, get a pre-own. It’s a very personal thing. Personally, I’m a value guy. And since I’m mechanically comfortable, I prefer to save up some cash. I got a great deal on this bike – and even with these additional expenses, it’s still worth it. I like my CB400X. Easy to procure spares and likely bullet-proof. Great choice. Where to get the oil pan? I cracked mine yesterday n now leaking. Try asking at FJT or Chong Aik. In our conditions esp when touring a 50w oil is a gd idea..
Also you may want to install an engine temp guage. My super4 which being an inline 4 ran hotter than the parallel twins and the fan only came on at the customs jam. Try switching to a car coolant like toyota and that should help heaps with the cooling. Which generation is your super 4 ? It shouldn’t ran hotter than a twin . 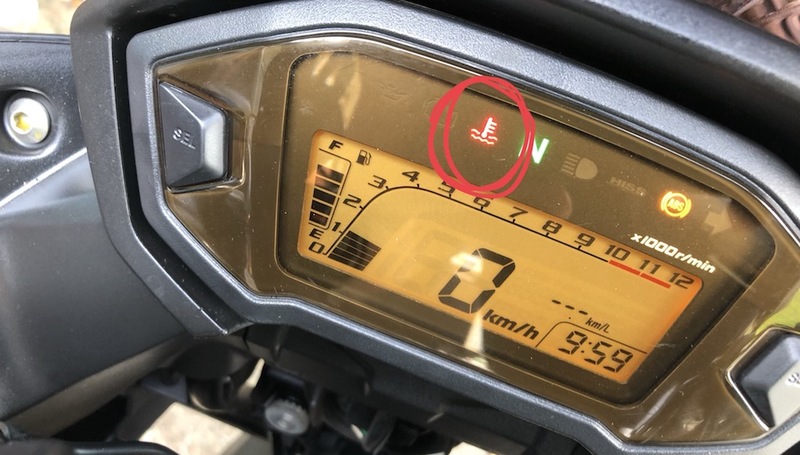 Just out of curiosity want to know more on your bike . Nicely done! I always recommend getting a used motorbike. You can open it up and work on it without worrying about warranty. Keep in mind that that bike was once new and the owner was not that mindful. Feeding and caring for the motorbike is a hands on job of a true biker! Have you experience smoke / steam coming from the radiator area? 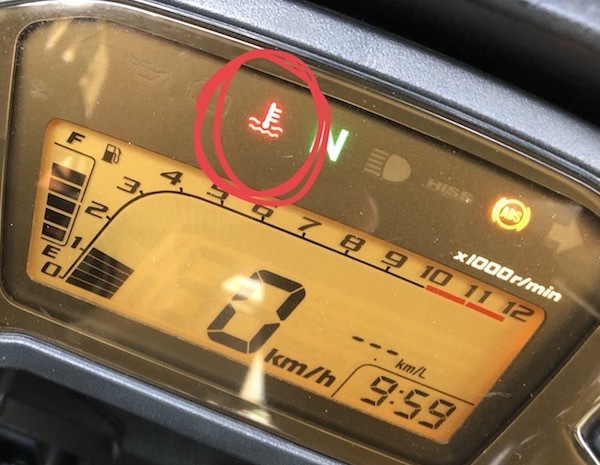 It was raining and when parking my bike then I noticed. Only that one time but now ok. Any idea if it’s something I should get it check? Probably just evaporating steam that got trapped there when it rained. Ahh, I see. Thanks, man. It’s always a good read here. Not only on your adventure but you’re willing to share your knowledge and help others. Much appreciated. Ride safe. 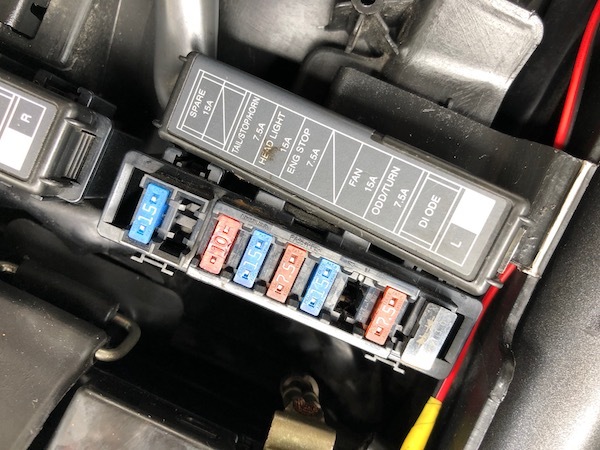 Looks like the Tail/Stop/Horn is using a 10A fuse instead of the 7.5A indicated on the label. Not a big deal though, but worth replacing it if you happens to get the chance. Yes – you’re correct. But I suspect the original 7.5A fuse was replaced by a 10A one as the previous owner modified the horn to a (louder?) 2-horn setup. The 2nd horn will draw additional current. Thus, the increased fuse rating was probably justified.